LOL, now this is a cheeky wink-wink way to have some fun with the leading lady in Marry Him If You Dare (Mirae’s Choice) since she’s being played by former idol girl Yoon Eun Hye. It’s been ages since she was a member of Baby V.O.X. and frankly they were a middling girl group at best so it’s not like Yoon Eun Hye had a storied idol career before becoming an A-list actress. 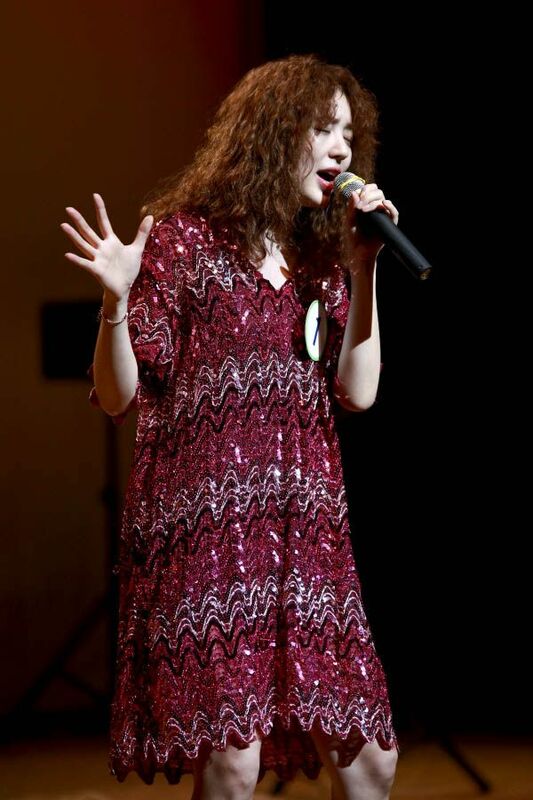 But it’s still adorable to see her singing on stage in a live performance, and in the upcoming drama, Yoon Eun Hye’s character Na Mi Rae belts out the Korean version of Gloria Gaynor’s classic girl power anthem “I Will Survive”. Hilariously, the Korean version is called “I’m Okay”, which is about the power of the lyrics I Will Survive dialed down to a kitten’s meowing of I’m Okay. 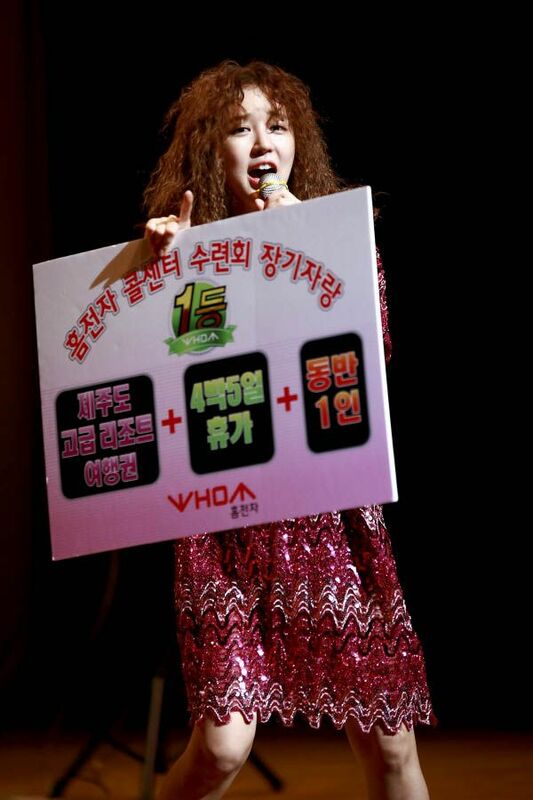 In this scene, Na Mi Rae performs at a company organized talent show where the grand prize is a four day trip to Jeju. I totally perked up at that! I love Jeju location shoots, and in Yoon Eun Hye’s last drama she had an amazingly romantic and gorgeous shoot there with Yoo Seung Ho’s character. Yunno, before the scriptwriter threw his characterization to the wolves. Back to MHIYD, Mi Rae’s company during this talent competition is the calling center where she works as a low-level contract employee and she’s so eager to win the prize that she decks herself all out and belts out the song like there was no tomorrow. Yoon Eun Hye’s work ethic and idol background must’ve blended together into perfect synergy because she apparently did the performance in one take without any NGs. She was animated and shaking her thang onstage and having so much fun the staff members said her energy was contagious. I actually think this fried hairstyle is growing on me, in the usual way anything Yoon Eun Hye touches grows on me. It’s ugly as all out but she adds a touch of cuteness. I wonder if either male leads Lee Dong Gun or Jung Yong Hwa are going to have occasion to sing in this drama. If so, make it a duet please, writer-nim. Interestingly, Jung Yong Hwa is seen in Gimpo airport early this morning en route to Jeju for filming. So it’s possible that Yoon Eun Hye’s character (Mi Rae) and Jung Yong Hwa’s character (Park Se Ju) will meet in Jeju for the first time after she wins that prize from the talent show. The plot seems to be getting interesting as each still/news is revealed. looking forward to this drama, love yeh so much! I think she sported worse hairstyle in Coffee Prince… and yet it grew on me… and I still think that CP was one of her best performances. Yes. To me, YEH is a bad hairstyle is a good thing. So many shows to manage in October….phew…..
She looks cute, by the way…..
That hair! That dress! This show seems to be getting more interesting by the day. eun hye’s soooo cute…love her soooo much!!! With that kind of hair she looks more like Alla Pugacheva than Tina or Gloria. oh yeah..can’t wait to see that performance..she looks so adorable! awwww she looks adorable! But to be honest, from what I remember even the child version of YSH’s character in I Miss You was pretty psychopathic and possessive of YEH’s younger version and iirc he caused the detective ajusshi’s death with no remorse, so that wasn’t a last-minute switcharound so much as a case of he’s always been like that. I loved her Jejudo shoot in Goong, though. Especially when she and Joo Ji-hoon sang the Three Bears song. I just hope she and Lee Dong-gun have chemistry as great as I expect, because my expectations are climbing with every still released – first wet LDG, now singing YEH? I cannot wait! she reminds me of Julia Robert’s hair. only actress with great charisma can pull it off. I was just thinking ‘the hairstyle is growing on me’ right before i read the part where you said the hairstyle was growing on you. Seriously, the more i see it the more i actually like it! It’s so atypical for a k-actress to be sporting hair like that for a k-drama. Kind of makes the character they play unique. Gives Mi Rae that trademark that other heroines don’t have. One of the dramas I am looking forward to this fall. These pictures put a huge grin on my face. I can already hear YEH’s voice and imagine her gyrating to the beat. Welcome back my funny girl. I have missed you so much. She is so adorables…Her hair reminds me of Anna Hathaway in Love n Other Drugs Movie..
Oh my even with that ridiculous hair she is still attractive. That’s what you call an actress with tons of charisma. Looking forward to this drama, though I have a list of dramas to watch, I’m hoping this will be one that I can stay with till the end. I love YEH’s quirkiness and yet she delivers when its time to be serious. How are you able to judge that the leads don’t have chemistry when they don’t even have any interactions yet (that we’ve seen), not even stills of the leads together? my mom’s favorite dramas are Goong (which she LOVED) and Lie to Me so she’s pretty much a default YEH fan. We’ll probably be watching this together as it airs or after. Can’t wait! I am eagerly waiting for this drama to air. YEH is gifted of making people laugh. Love her so much. The only celebrity I ever followed. Wish you the best YEH. Can’t wait!!!! Yeh really does shine in rom coms. 20 more days. Sigh, Yoon Eun Hye!!! OMG I can not wait, YEH looks so adorable and fun with your curls without doubt has returned ROMCOM queen. This is weird..am I the only one who can hear YEH belting it out just by looking at her pictures? anyways, this only make me more excited for the drama. October, hurry up! I bet YEH will still look adorable even if she shaves her hair! She is the only Korean actress whose drama I watch “raw” and I don’t understand Korean. I can’t wait till Oct.
@ JSD, why do you say Yoon Eun Hye never was an A lister actress in Korea, are you from Korea? Anyway, Yoon Eun Hye is an Hallyu Star, which means she is well recognized all over the world. You know that an A Lister actress is not only known in their country, but in other part of the world, she is marketable to other countries. An A lister is someone who has many hits shows and has received numerous Best and Excellence actress awards. She started as an actress on later date but she became very famous and surpassed any A lister actors/actresses in terms of highest paid actress at an early age. Besides acting, she was and still the most sought endorser of big time products and cover of many magazines. Everytime she appears in an event, she will be the subject of the media people and a trend setter, as well. I’m sure there is still a lot of her being one of the most sought actresses in Korea, but what I mentioned are just few of them. So this might help you realize why YEH is an A list actress. Oh, and the latest, she is no. 1 in Japan for their contest as best female actress category which they only do every 10 years. So there is my Yoon Eun Hye, the only Korean actress I admire.